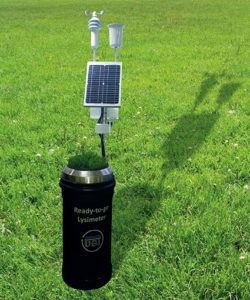 The Ready-to-go Lysimeter is a small lysimeter station for soil columns with an area of up to 0.5 m² and a length of up to 1 m. The RTG lysimeter is suitable both for disturbed soil (filled by hand) and for undisturbed soil monoliths when using the patented UGT extraction technology. 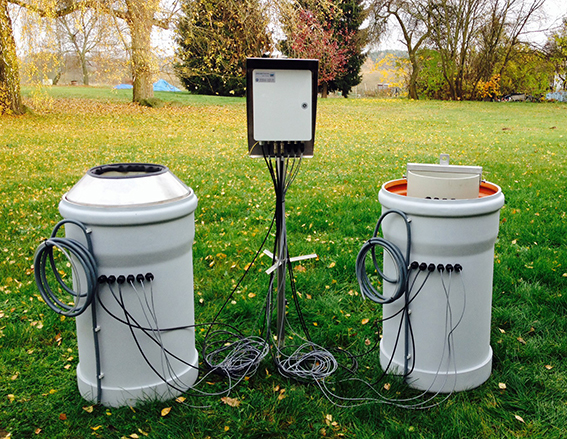 The compact lysimeter station consists of a PE-HD lysimeter vessel with weighing system and seepage tank with tipping bucket, a weather station, a data logger and a range of soil hydrological sensors. The system operates as plug and play system, so that the entire station can be erected and put into operation without special tools or specialist personnel. The data are displayed on the internet using the SVADSS online data management system.Up to four Ready-to-go Lysimeters can be connected to one data logger. The RTG-Lysimeter is the ideal supplement to an existing weather station for directly calculating evaporation.